Localised grassroots anti-Roma protests seen in the Czech Republic now seem to be repreated on a somewhat larger scale in Bulgaria: the Novinite agency is reporting clashes between riot police and a crowd of 3000 in the city of Plovdiv resulting in mass arrests with similar confrontations having taken place in the past few couple of days in Varna, Blagoevgrad and Sofia. The sequence of events in both countries seems very similar: a violent incident between local Roma and members ethnic majority triggers large-ish scale local protests of hundreds or thousand, sometimes initially peaceful but quickly becoming more unpredictable, more spontaneous – Facebook is mentioned in the reports on Bulgaria – and more aggressive, targeting Roma property, local authorities and the police. The crowds are mostly, but not exlusively young, and mainly male and, unusually, the protests spread. Far right groups are involved and the protests have clearly nationalist flavor with national flags – as well as predictable stuff about Roma crime etc – on display in reports from both states, but there also a sense of a kind grassroots ‘social movememt’ feel to what seems to be going on, the mobilisation of uncivil society, if you will. Bulgaria’s far-right party Ataka, for example, seems to have been caught on the hop with calls for emergency measures and hurring to organise its own party-controlled anti-Roma protests. 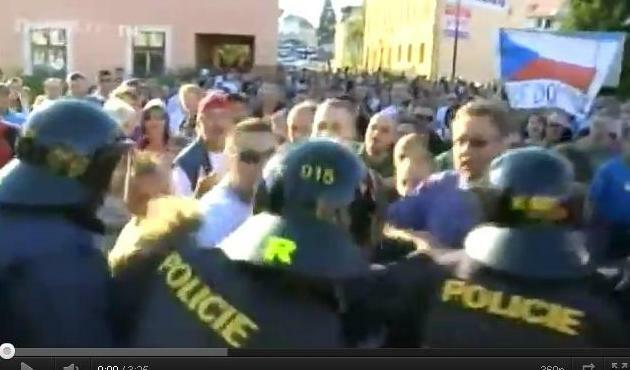 The question, of course, is why given high and consistent levels of anti-Roma racism in the CEE; huge levels of social exclusion and the often dire state of relations between Roma and majority groups, is why such protests have erupted now? An easy answer , perhaps rather too easy, is that it is a yet another symptom of the new Europan politics of Hard Times we seem to be drifting into, a mixture of fear and boredom: an ethnicised East Central European version of the frustrations and tensions we saw break out on the streets of England cities last month. Roma are among the socially and most economically vulnerable to price rises, welfare cuts and austerity, but they offer a convenient focus for the frustrations of others feeling the social and economic fallout at first hand. The Czech news magazine Respekt carries a profile of a young woman, Lenka Zenkerová , arrested during an anti-Roma protest last month for wearing a t-shirt with the home-penned slogan ‘Bring Back Hitler, Gas the Gypsies’. Such blatant incitement to racial hatred is a crime- triggers action even in the Czech Republic, where anti-racism laws can be somewhat unevenly enforced. Most protesters were savvy enough to frame their sentiments – at least in writing – in terms of crime and social security, rather than repeat this widely seen Czech skinhead grafitto of 1990s. In the profile Ms Zenkerová comes across as odd, but not that odd. Educationally an average achiever, cut off from her parents in the way some people are. A few stints at menial jobs, but she can’t stand them or does stick. Little money – minimal social security and the odd family handout or bit of internet-based work. Feels bored and trapped in a small town. The anti-Roma protests seem for her to be source of excitement, empowermant and minor celebrity. Perhaps in this country she would have just helped trash the local branch of Dixons. I guess that’s what makes us an advanced democracy. In CEE, of course, with its weaker parties and institutions more generally discontented and distrustful citizenry, you have to ask where it will all lead. Whether it will find stronger political expression or just be one of numerous poisonous undercurrents running beneath the region’s social and political development. 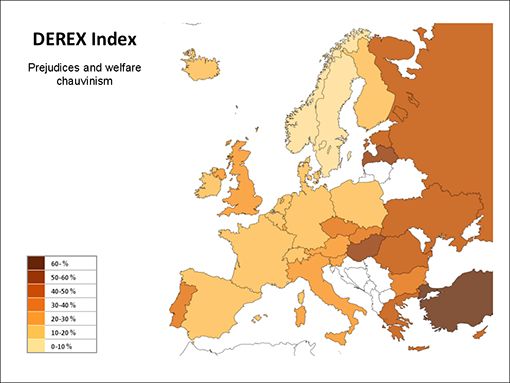 Bulgaria came third in the DEREX index of far-right electoral potential put together by the Budapest-based Political Capital Thinktank last year – Turkey and Hungary came top with the Czech Republic mid-table a mere 11th. As noted in the previous post, far right parties may not ultimately be the big story politically, we darkly image, but it will interesting , indeed necessary for once to watch the small town and regional grassroots for once.